During a summer 2011 fellowship in rural India, Bryan Lee '12 listened to dozens of farmers share stories detailing agriculture's hardscrabble life. "It struck me that this group of people — as many as 200 million of India's rural poor — had little hope for a better future," Lee says. Their personal stories moved Lee to act. Soon after returning stateside, Lee founded Krishi Star (formerly Kisan First), an organization seeking to reduce rural poverty by providing farmers with greater ownership within the food value chain. The upstart organization increases and stabilizes its farmers' incomes by installing the infrastructure — specifically, small-scale processing units — necessary to process crops into higher-value products and sell those yields in urban markets. These moves minimize unpredictable weather and market demand risks. "By giving farmers more ownership in the value chain, we are helping them hedge these risks by decreasing the portion of their incomes that is harvest-related and linking them to a larger network that can cross-subsidize these risks," Lee says. Little over one year into its existence, Kisan First has finished its initial product development stage, acquired customers and launched manufacturing. The organization currently is working with tomato farmers in the western Indian state of Maharashtra and selling processed tomato products to restaurants in Mumbai. Lee looks to expand Kisan First's work to additional crops and markets, though he believes the organization's core competency will eventually swing to marketing and product development. 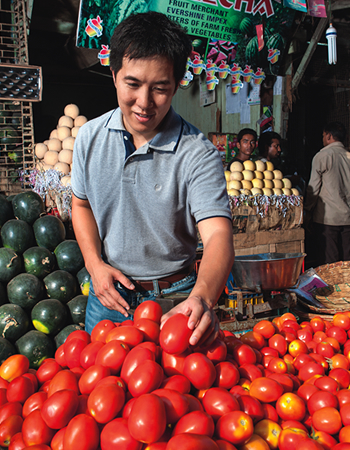 "Tomatoes are just the market entry strategy and testing ground for our impact model," Lee says. "Tomatoes are just the market entry strategy and testing ground for our impact model. With Kisan First generating interest from investors and like-minded social enterprises, Lee admits a struggle in balancing entrepreneurial fervor with manageable growth. "There have been times when our desire to follow up with all potential leads … has kept us away from doing what is most crucial for us at this point: moving the pilot forward," Lee says. While Kisan First plans to continue entering niche markets with few reputable rivals, Lee knows that emerging competition will challenge his organization's growth potential. "Our ability to defend our customer base against companies with potentially more resources and more experience will be crucial," he says. To that end, Lee has developed strong ties to credible, farmer-centric agricultural agencies throughout India. Within the next five years, he hopes Kisan First can secure buy-in from more than 10,000 farmers.